Fishermen Returning to Whitby, watercolour on paper, signed A. Smith (Austin Smith), c1920. Framed and glazed. Fishermen Returning to Whitby, watercolour on paper, signed A. Smith c1920. Ranchi Art and Antiquarian Books Shop > Alphabetical list of Artists by Surname or School. 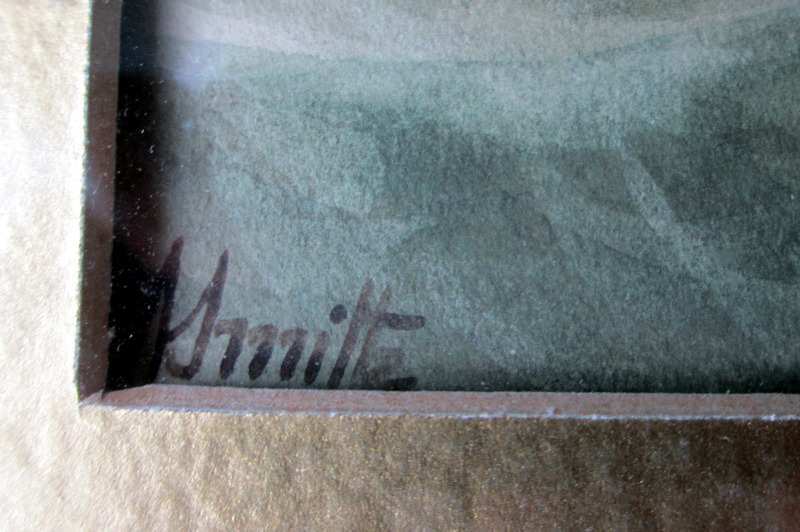 > Smith, A. (mid-19th C Maritime). British. Watercolour on paper, framed and glazed. Dimensions : Frame : 568mm x 445mm x 17mm. Image : 345mm x 220mm. Weight : 2.500kg net. Condition : Good. 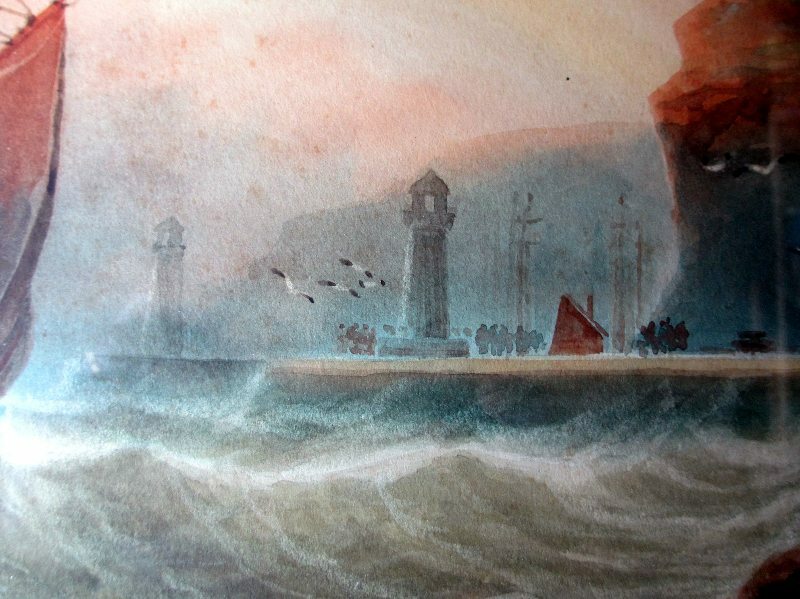 Fishermen Returning to Whitby, watercolour on paper, signed A. Smith (possibly Austin Smith, 19th/20th Century English School), c1920 (much earlier if not Austin Smith). Framed and glazed. Dimensions : Frame : 568mm x 445mm x 17mm. Image : 345mm x 220mm. Weight : 2.500kg net. 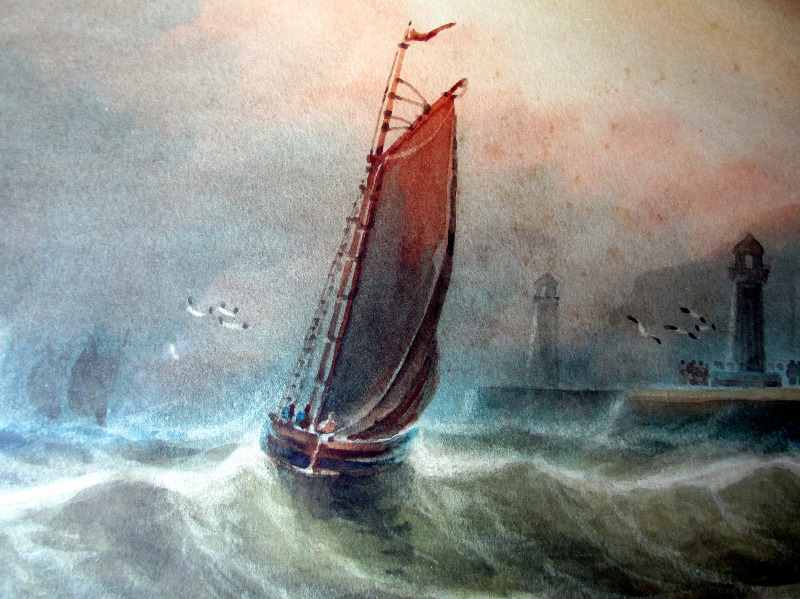 Condition/Notes : The watercolour on paper painting depicts several fishing boats returning to Whitby Harbour ahead of an approaching storm and the focus of attention is the nearest boat which is fighting against the prevailing wind attempting to enter the protection of the harbour. St. Mary's church atop the East Cliff stands out against the evening sky and the Abbey can be seen behind the church. The extent of the erosion of the cliff face can be seen in this painting when comparing it to a contemporary photograph of the same view. 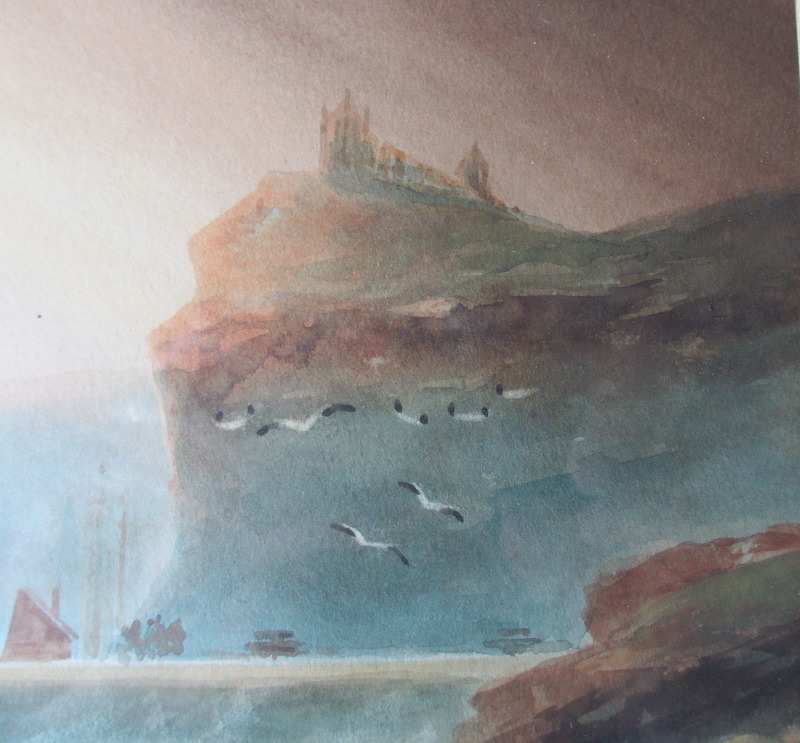 The painting is typical of the work of this well-known artist who painted many such scenes around Whitby and Scarborough and is renowned for his maritime studies, although this attribution is not certain. 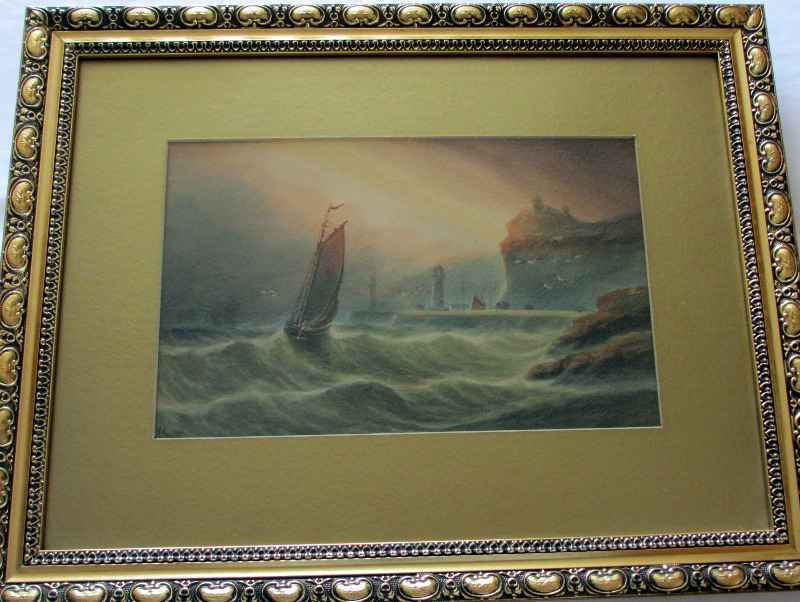 There are indications that another artist known as A.Smith was active in the mid 1800's. Any further information regarding this will be added in due course. (Any information regarding this artist is welcome). The artist's signature is in the lower lh corner. The painting is displayed within a gilt mount, typical of the period, which is in good condition. The heavy decorated gilt wooden frame is also in good condition with light wear to the edges; verso closed with a cardboard sheet nailed in place and sealed with 38mm self-adhesive tape. Framer's label attached to lower edge and a title label "Fishermen returning Whitby" attached lower lh corner. 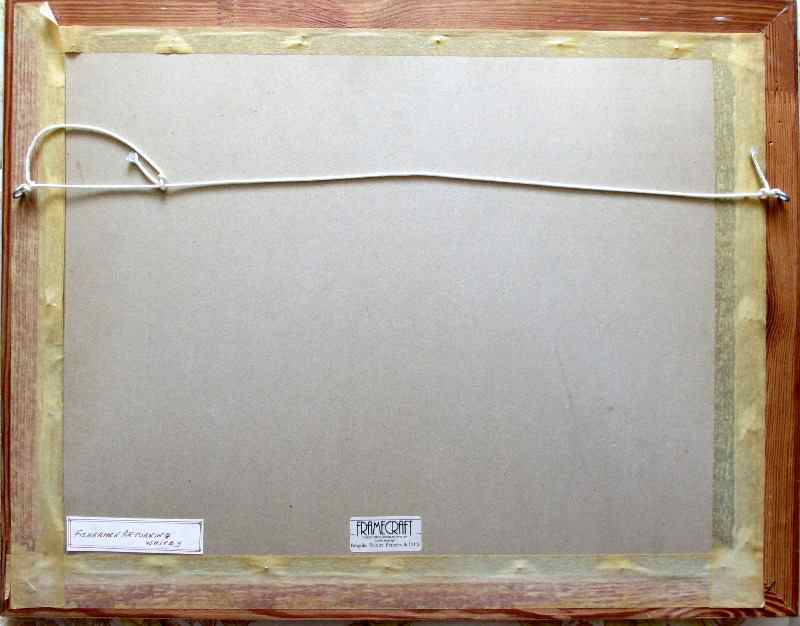 Hanging cord attached. Shipping Bands : UK : Free Delivery. Europe : £40.00 . World : £50.00. Note : The painting can be shipped unframed : UK : Free. Euro: £10.00. World : £12.00.